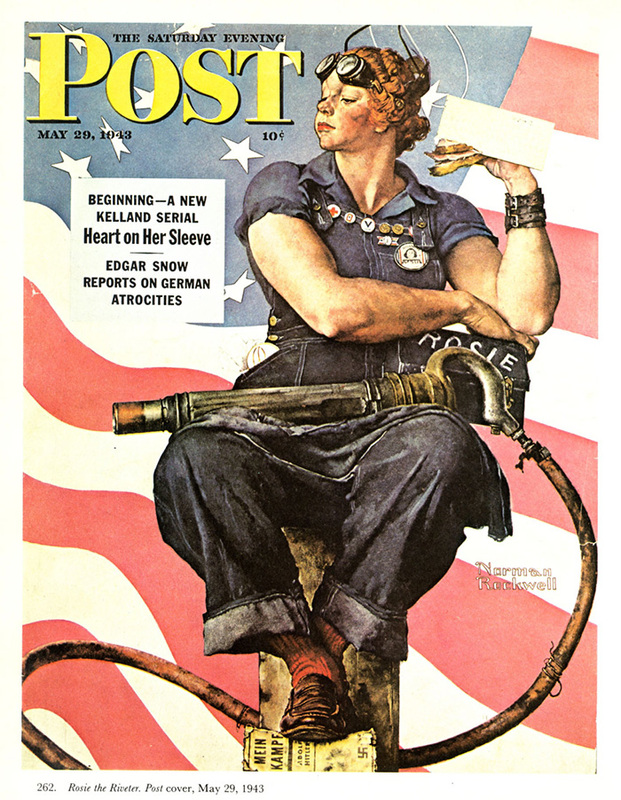 Saturday Evening Post cover May 29, 1943. Norman Rockwell’s Rosie the Riveter received mass distribution on the cover of the Saturday Evening Post on Memorial Day, May 29, 1943. Rockwell’s illustration features a brawny woman taking her lunch break with a rivet gun on her lap, beneath her a copy of Hitler’s manifesto, Mein Kampf and a lunch pail labled “Rosie”. 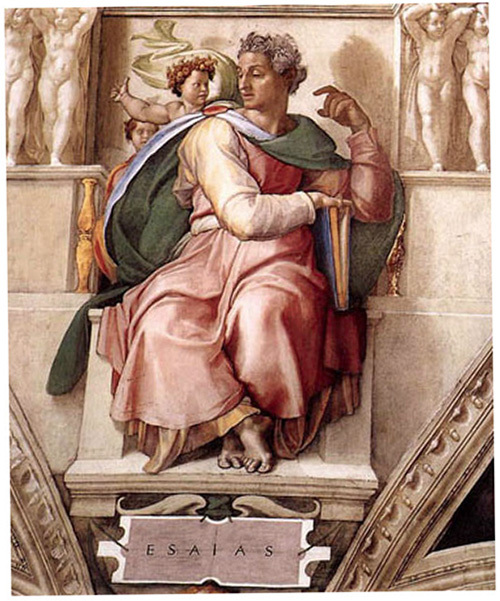 Rockwell based the pose to match Michelangelo’s Sistine Chapel ceiling painting of the prophet Isaiah. Rockwell’s model was a Vermont resident, then 19-year-old Mary Doyle Keefe who was a telephone operator near where Rockwell lived, not a riveter. Rockwell painted his “Rosie” as a larger woman than his model, and he later phoned to apologize. 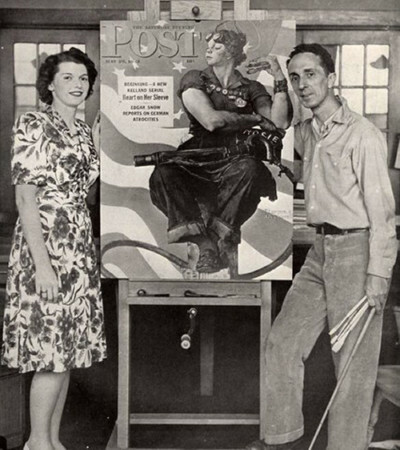 The Post’s cover image proved hugely popular, and the magazine loaned it to the U.S. Treasury Department for the duration of the war, for use in war bond drives. Below is a video interview with the model for “Rosie the Riveter” Mary Doyle Keefe. Listen to the adult and family audio segments from the Museum’s digital gallery tour for Home for Christmas. Learn more about the Museum’s Digital Gallery Tour. [NARRATOR] During World War II, the character of “Rosie the Riveter” came to represent all women who took over previously male-only jobs on the home front. Rockwell’s “Rosie,” from 1943, became one of the best known. Sitting on a lunch break, rivet gun on her lap, she’s a proud and monumental presence. [HENNESSEY] She’s based on the figure of the prophet Isaiah from the Sistine Chapel ceiling, and so she has these massive forearms, very, very muscular… but in fact, while she has this extraordinarily masculine build, she herself has a very feminine face, and there are all these little touches that show you that she’s still a woman. [NARRATOR] Rosie wears lipstick while she works. Look at her hand holding the sandwich. Her fingernails are polished. And look in her pocket, near the middle of the painting. Peeking out is a lacy handkerchief and compact. These feminine touches suggest that her male job is only temporary. The U.S. government pointedly emphasized to women that their new roles were for the duration only. After the war, they were expected to return home. [HENNESSEY] The other thing that I love is she’s got her foot firmly planted on “Mein Kampf,” Hitler’s manifesto. …. again, it’s the kind of little detail that often doesn’t get picked up when you’re just looking at that image reproduced on the cover. [NARRATOR] Now, look up at Rosie’s head. [HENNESSEY] She also has a halo, which I think is lifted from Isaiah, but which I think gives an indication of how Rockwell viewed these women who had gone into the factories and were doing this kind of work, which in that day and age was a very new experience. [NARRATOR] –(shouting) it’s used to build things. [NARRATOR] There were thousands of women like Rosie that built big ships for the Navy, airplanes for the Air Force and tanks for the Army. It was tough, hard work. Look up behind Rosie’s head. Did you notice she’s got a halo? 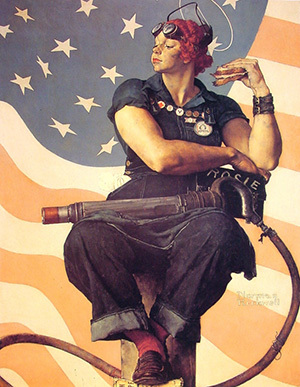 After the war, the Rockwell “Rosie” was seen less and less because of a general policy of vigorous copyright protection by the Rockwell estate. In 2002, the original painting sold at Sotheby’s for nearly $5 million. In June 2009 the Crystal Bridges Museum of American Art in Bentonville, Arkansas acquired Norman Rockwell’s iconic Rosie the Riveter painting for its permanent collection from a private collector. In late 1942, Doyle posed twice for Rockwell’s photographer, Gene Pelham, as Rockwell preferred to work from still images rather than live models. The first photo was not suitable because she wore a blouse rather than a blue work shirt. In total, she was paid $10 for her modeling work (equivalent to $138 in 2016). In 1949 she married Robert J. Keefe to become Mary Doyle Keefe. The Keefes were invited and present in 2002 when the Rockwell painting was sold at Sotheby’s. In an interview in 2014, Keefe said that she had no idea what impact the painting would have. “I didn’t expect anything like this, but as the years went on, I realized that the painting was famous,” she said. Keefe died on April 21, 2015, in Connecticut at the age of 92.